Cambridge Design Partnership is a successful innovation partner focused on creating value for our clients by transforming new ideas, design and technology into commercial success. Our clients operate in consumer, medical, industrial and cleantech markets. They have one thing in common they see investment in innovation as fundamental to growth and competitive advantage. Our staff of designers, engineers and scientists has grown rapidly to establish a world leading reputation for technical excellence, astute project management and, above all, thinking differently. The team have been responsible for many hundreds of new product development projects and patents, winning a host of international design and innovation awards along the way. 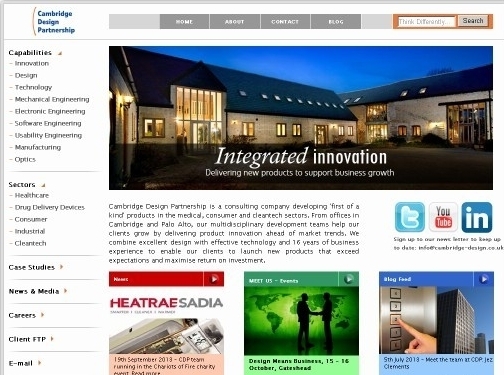 UK (Cambridge) and US based company - with over 16 years' experience - providing product design services. Website includes details of services provided, case studies, testimonials, blog, full company contact details including company registration number. Company website has been online since 1999 according to web.archive.org.